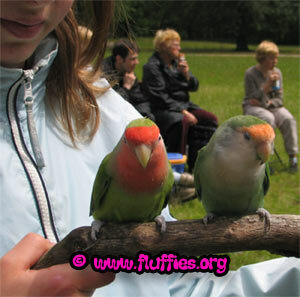 Want to see more diary entries with photos? Then please click this link! 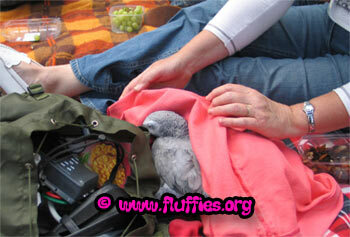 When we sat down, this grey was obviously a bit tired and tried to retreat under his mom's coat. Cute isn't it? While the grey was trying to sleep, Iago had other things in mind.. Like picking out the best grape out of a box of another person's grapes! 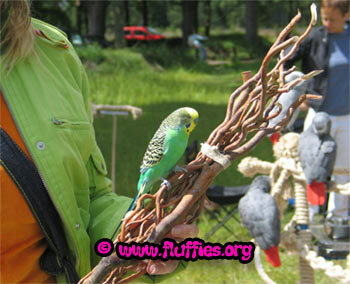 Here is another photo of the budgie.. Isn't he beautiful and super cute? ;-) He was quite willing to pose! This amazon parrot was exhausted.. 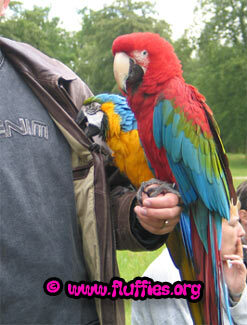 I had heard that last year, this amazon parrot was chatting, laughing & crying all picnic long. Obviously, all this activity made him tired! Iago wasn't impressed by the blue and gold macaws. Not even when one came very close. 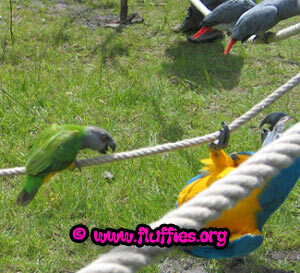 On the photo, Iago isn't chasing away the blue and gold macaw, but just watching him, dangling of the rope..
Two lovebirds: Sjonnie & Anita.. Sjonnie was in for his beauty rest.. The cockatiels were sleeping as well, well, not all! 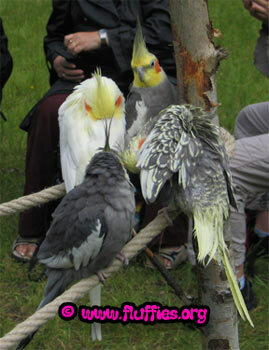 Some were preening! 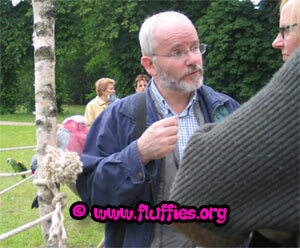 This is my avian vet explaining things to people..
Pico & Pablo.. Pico is looking in his dad's pocket if there's anything edible in there! The story continues on page 8!